Had something happen tonight that was a first for me. It has happened to lots of other people like me. I’ve attended get togethers that oppose this sort of thing happening. I’ve been lucky in not experiencing it thus far, until tonight. I’ve taken loads of photos in and out of rail stations and various other public places in London. It’s kind of my hobby as most have probably figured out. I’ve been fortunate that I’ve never been hassled about taking photos anywhere. I few odd ‘weirdo’ looks from staff members, like when I spent about an hour photographing the inside of Paddington Station a while back (that I don’t believe I’ve posted yet). But I was never troubled. Enter my tripod. It makes all the difference. That and what side of the street you are standing on. I set up my tripod and camera across the street from the Liverpool Street entrance of the station with the same name and was snapping away happily, moving around a bit with just the odd funny person dancing about in shot (I started to laugh, he apologised). ‘ I’d like to get a closer shot of the turrets’ I think to myself. Pick up the tripod, walk across the street and set down along the fencing as to not get in any one’s way. Start lining up my shot and I see a chap in a Network Rail jacket making his way over to me. Oh crap, how is this going to play out? There’s been lots of horror stories about these confrontations. ‘Hiya!’ I say. ‘You’re not supposed to take pictures here’ he says back. ‘Oh really?’. Yeah, no photos on the station is the answer. ‘Oh that’s a shame’ I say, while chuckling a bit. He told me that he nearly didn’t see me. I’m not sure what that was supposed to mean. The guy sort of shrugs and walks away after I turn my camera off. That wasn’t too painful, but still was just so silly. I know there’s the angle of him just doing his job and whatnots. 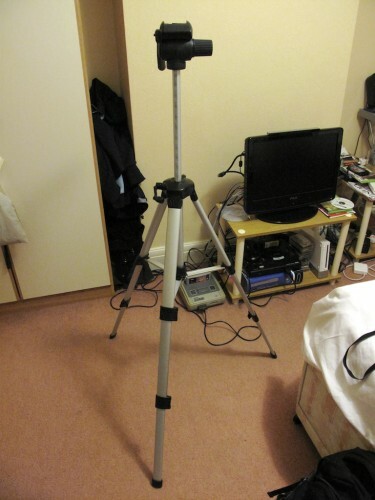 But what is it about the tripod that made taking photos so bad? Is it that threatening that I just want a nice crisp shot of an architectural feature of the station? I thought I’d get some possible flack when taking shots of Tower 42 or when I was stood in the middle of the Charles I statue roundabout at Trafalgar Square taking shots of Whitehall. Nope, nodda. Will be interesting to see if I run into the issue at any more stations. If I do, it could put a real damper on a project that I want to work on this year. At least I can be thankful of one thing, he didn’t come right out with the excuse of it being anti-terrorism. So, a lesson learned. That and don't use a tripod. 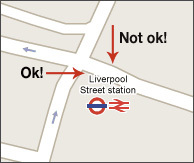 Sorry you had a problem at Liverpool Street. Unfortunately it comes under the section entitled ‘Enthusiasts’ but it will tell you what you can/can’t do on stations managed by us (Network Rail). In simple language, you are welcome to photograph, let us know you are on the station and you can use a tripod as long as it is not a health and safety issue.